PETALING JAYA: Subang Jaya will continue to command good demand for its properties, especially lifestyle products priced below RM250,000. Titijaya Sdn Bhd director Chairmaine Lim Puay Fung in making this observation said this had been proven during the first day of the preview of the company’s The Studio @ First Subang (Northern Tower) in SS15, Subang Jaya, where 50 units were sold within a few hours. The Southern Tower at First Subang was launched last year. “Most of the purchasers are repeat buyers, a fact that we are most proud of,,” she told StarBiz. The Studio consists of flexible studio office suites, with en suite baths. Units range from 472 to 954 sq ft.
Lim said sales had been good with 45% of The Studio in the Northern Tower sold although it had not been officially launched. “We have also achieved 80% sales for Southern Tower. We only soft-launched it towards the end of June,” she said, adding that construction started last year. The gross development value for each tower is about RM120mil. 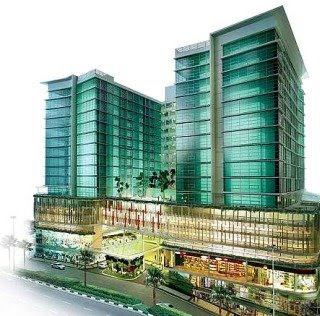 First Subang also consists of three levels of shopping podium, which is only for lease. Lim said the purpose was to control the tenant mix and thus enhance the its value. The pricing is from RM410 per sq ft.
She said The Studio’s flexible studio office suites were suitable for those wanting to have a modern and fun working unit with security features. “The project is due for completion in 2009 and we are ahead of schedule,” she said. On the rising construction costs and inflation, she said there would definitely be an increase in property prices but this increase had not been fully transferred to the consumer. “Hence, it is a good time to purchase (property) now, as most developers are subsidising the cost, and lowering their profit margin in the process. “Moreover, investment in property is the best way to hedge against inflation. With inflation, construction costs are bound to go up further,” she said, adding that demand for properties depended very much on the product and location. SINGAPORE: CapitaLand Ltd, Southeast Asia's largest real estate player, may delay the launch of its retail property trust in Malaysia if market condition worsens over the next few months. The Singapore-based group plans to launch a real estate investment trust (REIT), worth in excess of RM2 billion, by the end of this year or early next year. It will include Sg Wang Plaza in Kuala Lumpur, Gurney Plaza in Penang and Mines Shopping Fair in Seri Kembangan, Selangor. President and chief executive officer Liew Mun Leong said it will "pull the trigger" when the market permits. "Real estate is a function of economic growth. Right now, we are targeting to get approval for the REIT by the fourth quarter of 2008. If the market weakens, we may delay the launch," he said at a media briefing in Singapore yesterday. In addition, CapitaLand will invest the proceeds from the sale of its 30 per cent stake in Menara Citibank in Kuala Lumpur by buying more properties in Malaysia. It may also build new malls and buildings, but Liew declined to say if the properties will be injected into the REIT later. "We have asset allocation plan which is to invest now. So when we sell Menara Citibank, we will invest in new projects in Malaysia," he said. Liew said CapitaLand will look for properties within its five strategic business units - residential; commercial; retail/financial; integrated leisure, entertainment and conventions; and The Ascott Group. "When we build our retail portfolio and have promising returns, we will inject into the REIT. We will rejuvenate existing malls for higher yields so the REIT could absorb it," he said. SINGAPORE: CapitaLand Ltd sees potential to expand its foothold in Malaysia’s real estate market in line with long-term plans to build its portfolio in the commercial and residential property sectors, group president and chief executive officer Liew Mun Leong said. “Malaysia, which is expected to record a gross domestic product growth of 5% to 6% this year, offers good potential in both the residential and commercial property sectors. “Through our equity stake in United Malayan Land Bhd, Quill Capita Management Sdn Bhd and Malaysia Commercial Development Fund (MCDF), we have exposure in both the residential and commercial property sectors,” Liew told Malay-sian journalists at CapitaLand’s head office yesterday. CapitaLand is one of the largest foreign investors in Malaysia’s real estate market. Through its real estate private equity funds, Mezzo Capital Fund worth US$30.5mil and MCDF US$270mil, undertaken jointly with the Malayan Banking Bhd group, it is involved in real estate development projects in Kuala Lumpur and the Klang Valley. Quill Capita Management, which manages the main board-listed Quill Capita Trust, is 40% owned by CapitaLand Financial Ltd through wholly owned unit CapitaLand RECM Pte Ltd, while Quill Resources Holding Sdn Bhd and Coast Capital Sdn Bhd each has a 30% stake. In service residences, CapitaLand’s The Ascott Group owns and manages seven properties with a total of 814 units in Kuala Lumpur and Kuching. The company plans to list its RM2bil real estate investment trust on Bursa Malaysia and hopes to receive the go-ahead from the authorities by the fourth quarter. According to CapitaLand Retail Ltd and CapitaMall Trust Management Ltd chief executive officer Pua Seck Guan, CapitaLand is also looking to expand in Malaysia’s retail mall sector through asset acquisitions and new developments. “We have created a strong franchise and asset management capability that will allow us to enlarge our presence in the retail malls sector in the regional and international markets. “Malaysia’s relatively fragmented and untapped retail property sector offer much potential for CapitaLand to grow from our present three assets in Malaysia. We certainly want to grow our asset size to become one of the leading retail mall operators in Malaysia,” he said. On the international front, Liew said CapitaLand had embarked on building integrated developments in gateway cities under the branded name Raffles City. These integrated commercial projects incur high investment outlay or S$1bil each and the present gross development value of the six Raffles City products – four in China and one each in Singapore and Bahrain – is estimated at S$5bil. SINGAPORE: CapitaLand Ltd plans to build integrated developments internationally, including in Malaysia, as the returns are higher. In Malaysia, it plans to do this through its 21 per cent unit, United Malayan Land Bhd which has ample land, president and chief executive officer Liew Mun Leong said. "Integrated development is a new idea which we are promoting. Not many countries have done such developments on large scale," he told Malaysian journalists in Singapore yesterday. CapitaLand is currently developing six such projects comprising cover hotels, serviced apartments, retail and commercial buildings in Singapore, China and Bahrain under the "Raffles City" brand, worth a combined US$5 billion (RM17.1 billion). Liew said it wants to build another Raffles City in gateway cities like Mumbai, India and Moscow, Russia, while not ruling out Malaysia. "There is good demand for the properties if there is a suitable location, but there must be mass traffic flow of people as it involves huge investments," Liew said. Meanwhile, Liew said CapitaLand hopes to meet its internal net profit and revenue target for its current financial year ending December 31 2008 through new product launches and sales from existing developments. Last year, CapitaLand posted a net profit of S$2.8 billion (RM6.72 billion) on the back of S$3.8 billion (RM9.12 billion) revenue largely because of capital gain. "It was a bumpy year last year. We were the best performing group on the Singapore Stock Exchange in terms of net profit. While we remain optimistic for 2008, it will be a tough year as the global economic is down," he said. "Demand is there but whether profitability is, is another case. But because we have diversification into other markets, it mitigates the situation of rising cost, inflation and a gloomy economy," he added. LONDON: Britain’s Prime Minister Gordon Brown yesterday cut an unpopular tax on home purchases as part of a package to boost the country’s slumping housing market and lift his flagging political fortunes. Brown’s government said properties worth less than £175,000 would be exempt from the tax, known as stamp duty, for one year, up from a £125,000 threshold now. The step was accompanied by a £1bil package to help first-time home buyers and people struggling to keep up with mortgage payments. “The stamp-duty holiday may provide the domestic housing market with a marginal stimulus but we doubt it will have a major effect in getting the housing market moving again,” said Philip Shaw, chief economist at Investec. The treasury said the rise in the threshold would cost it an additional £600mil and that half of home transactions would now be exempt from duty. House prices in Britain are sliding and home repossession orders in England and Wales have risen to their highest level since the housing market crash of the early 1990s. KUALA LUMPUR: Ireka Corp Bhd unit Ireka Engineering & Construction Sdn Bhd has secured a contract worth RM195mil from ICSD Ventures Sdn Bhd. The contract is for the proposed construction of a 26-storey commercial building, including five-storey shopping complex, four-storey convention centre and 12-storey hotel in Sandakan, Sabah, on a design-and-build basis, the company said in a statement. Works are expected to be completed on Nov 30, 2010.